Stewart Donald expects Lamine Kone to leave the club in the summer admitting he'd be 'amazed' if he ended up back in a Sunderland shirt. Donald was a special guest on the Roker Rapport podcast and was quizzed on the future of Lamine Kone, who remains a Sunderland player despite being out on loan at French side Strasbourg. The Sunderland owner doesn't expect the defender to return to Wearside at the end of the season though. Kone secured a season-long loan move to French side Strasbourg back in August and has impressed in Ligue 1 this term. They have an option on Kone, which Donald believes it is likely they will take up but either way he expects Kone to stay in France. "The club he's at have got an option which they can exercise if they want to keep him for a fee, we believe that is likely," said Donald. 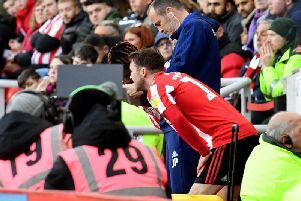 "If that doesn't happen based on what we're being told and how we feel, I think he'll find another club, I'd be amazed if you see Lamine back here in a Sunderland shirt. "To be fair to him he came here he trained and he was honourable, I've got no issue with him. "I think just with his stage of life he wants to go back and play in France."